High throughput validation of multiple candidate biomarkers can be performed by sequential ELISA in order to minimize freeze/thaw cycles and use of precious plasma samples. Here, we demonstrate how to sequentially perform ELISAs for six different validated plasma biomarkers1-3 of graft-versus-host disease (GVHD)4 on the same plasma sample. Fiema, B., Harris, A. C., Gomez, A., Pongtornpipat, P., Lamiman, K., Vander Lugt, M. T., Paczesny, S. High Throughput Sequential ELISA for Validation of Biomarkers of Acute Graft-Versus-Host Disease. J. Vis. Exp. (68), e4247, doi:10.3791/4247 (2012). Unbiased discovery proteomics strategies have the potential to identify large numbers of novel biomarkers that can improve diagnostic and prognostic testing in a clinical setting and may help guide therapeutic interventions. When large numbers of candidate proteins are identified, it may be difficult to validate candidate biomarkers in a timely and efficient fashion from patient plasma samples that are event-driven, of finite volume and irreplaceable, such as at the onset of acute graft-versus-host disease (GVHD), a potentially life-threatening complication of allogeneic hematopoietic stem cell transplantation (HSCT). Here we describe the process of performing commercially available ELISAs for six validated GVHD proteins: IL-2Rα5, TNFR16, HGF7, IL-88, elafin2, and REG3α3 (also known as PAP1) in a sequential fashion to minimize freeze-thaw cycles, thawed plasma time and plasma usage. For this procedure we perform the ELISAs in sequential order as determined by sample dilution factor as established in our laboratory using manufacturer ELISA kits and protocols with minor adjustments to facilitate optimal sequential ELISA performance. The resulting plasma biomarker concentrations can then be compiled and analyzed for significant findings within a patient cohort. While these biomarkers are currently for research purposes only, their incorporation into clinical care is currently being investigated in clinical trials. This technique can be applied to perform ELISAs for multiple proteins/cytokines of interest on the same sample(s) provided the samples do not need to be mixed with other reagents. If ELISA kits do not come with pre-coated plates, 96-well half-well plates or 384-well plates can be used to further minimize use of samples/reagents. Acute graft-versus-host disease (GVHD), a leading cause of non-relapse mortality (NRM) after allogeneic hematopoietic stem cell transplantation (HSCT), is measured by dysfunction in three organ systems: the skin, liver and gastrointestinal (GI) tract4. Acute GVHD typically occurs between two and eight weeks after transplant but may occur later, and is often clinically indistinguishable from other post-HSCT complications such as conditioning regimen toxicity, infection or medication side effects. Through the use of proteomic strategies and high-throughput validation using sequential ELISA, we have identified 6 proteins whose concentrations are elevated at the onset of clinical manifestations of GVHD. IL-2Rα, TNFR1, HGF and IL-8, when combined into a 4-biomarker panel can diagnose GVHD at the onset of clinical symptoms and can predict post-HSCT survival independently of GVHD severity1. Elafin, a biomarker for GVHD of the skin, can discriminate between GVHD rash and rash from other causes such as drug eruptions and can predict transplant survival2. We have recently identified REG3α as a biomarker of GVHD of the lower gastrointestinal tract, the target organ most associated with NRM. Plasma REG3α concentration can reliably identify GVHD as the cause for post-HSCT diarrhea and correlate to histologic severity of GVHD on diagnostic intestinal biopsies. 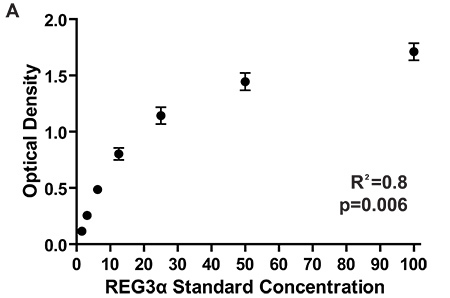 REG3α concentrations at GI GVHD onset can also predict responsiveness to GVHD therapy and NRM3. The incorporation of these validated GVHD biomarkers into clinical care is currently being investigated in clinical trials. These experiments were performed on small plasma aliquots collected from patients receiving HSCT between 2000 and 2010 at the time of GVHD onset that are irreplaceable and of limited quantity. Due to the precious nature of these samples, we have developed a method of measuring multiple plasma protein concentrations in an efficient, reproducible manner to eliminate excess freeze-thaw cycles, thaw time and plasma usage. This technique can be applied to perform ELISAs for multiple proteins/cytokines of interest on the same sample(s) provided the samples do not need to be mixed with other reagents. If ELISA kits do not come with pre-coated plates, 96-well half-well plates or 384-well plates can be used to further minimize use of samples/reagents. This manuscript focuses on the technological aspects of measuring GVHD biomarkers. Plasma aliquot samples to be analyzed will be pulled, thawed and spun at 12,000 rpm for 10 min to separate the clots at the bottom and lipids on top from the plasma. 150 μl of undiluted plasma will be plated from each sample onto a 96-well V-bottom plate (source plate) by manual pipetting according to predefined maps. The aliquots will be wrapped in parafilm and kept in a humid chamber at 4 °C during the entire process; no longer than 72 hr. IL-2Rα and HGF capture antibodies will be reconstituted and diluted per manufacturer specification and 50 μl will plated into each well of respective 96-well high-binding half-well plates which are then sealed and incubated overnight at 4 °C. Alternatively, many plates can be dried at 37 °C and stored at 4 °C for later use, depending on the stability of the protein. REG3α capture antibody will be diluted according to manufacturer protocol using manufacturer coating buffer and 25 μl will be plated in each well of a 384-well Nunc Maxi-Sorp plate which is then sealed and incubated overnight at 4 °C. The IL-2Rα test plate is washed, blocked with BLOTTO in TBS, and the standard is reconstituted and an 8-point standard curve is prepared per manufacturer protocol. After washing the plate following the blocking step, 50 μl of undiluted plasma is plated in duplicate from the source plate to the ELISA test plate, and 50 μl of each standard is plated in duplicate. The plate is sealed and incubated for 2 hr at room temperature on a plate rotator set at 300 rpm. The plasma is reclaimed from the IL-2Rα ELISA test plate and placed back in the undiluted plasma source plate. The ELISA is completed per manufacturer protocol (with volumes adjusted for half-well plates) and the optical density of each well will be read using a plate reader set to 450-570 nm, and the data saved and analyzed. 10 μl of undiluted plasma will be transferred to a separate v-bottom source plate. 90 μl of manufacturer-provided dilution buffer is added to each well to create a 1:10 dilution source plate. The REG3α ELISA is performed per manufacturer protocol (with volumes adjusted for 384-well plates) and the optical density of each well will be read using a plate reader set to 450-620 nm, and the data will be saved and analyzed. Elafin and TNFR1 capture antibodies will be reconstituted and diluted per manufacturer specification and 50 μl will plated into each well of respective 96-well high-binding half-well plates which are then sealed and incubated overnight at room temperature for Elafin, and at 4 °C for TNFR1. After completing the IL-2Rα ELISA and assuring the test does not need to be repeated, 60 μl of undiluted plasma will transferred to a new source plate and then 60 μl of 1% BSA in 1 x PBS is added to each well to make a 1:2 diluted plasma source plate. The HGF test plate is washed, blocked with BLOTTO in TBS, and the standard is reconstituted and an 8-point standard curve is prepared per manufacturer protocol. After washing the plate following the blocking step, 50 μl of 1:2 diluted plasma is plated in duplicate on the ELISA test plate, and 50 μl of each standard is plated in duplicate. The plate is sealed and incubated overnight at room temperature on a plate rotator set at 300 RPM. The 1:2 diluted plasma is reclaimed from the HGF ELISA test plate and placed back in the 1:2 diluted plasma source plate. The ELISA is completed per manufacturer protocol (with volumes adjusted for half-well plates) and the optical density of each well will be read using a plate reader set to 450-570 nm, and the data saved and analyzed. 10 μl of undiluted plasma will be transferred to a new source plate and then 190 μl of 1% BSA in 1 x PBS will be added to each well to make 200 μl of plasma dluted 1:20. The Elafin ELISA as performed according to manufacturer protocol (with volumes adjusted for half-well plates), and the optical density of each well will be read using a plate reader set to 450-570 nm, and the data saved and analyzed. 25 μl of 1% BSA in PBS will be added to the 1:20 source plate (now containing 100 μl of 1:20 plasma) to obtain 125 μl of 1:25 diluted plasma. The TNFR1 ELISA is completed per manufacturer protocol (with volumes adjusted for half-well plates) and the optical density of each well will be read using a plate reader set to 450-570 nm, and the data saved and analyzed. 60 μl of 1:2 diluted plasma will transferred to a new source plate and then 180 μl of IL-8 diluent is added to each well to make a 1:6 diluted plasma source plate. The IL-8 ELISA is completed per manufacturer protocol (with volumes adjusted for half-well plates) and the optical density of each well will be read using a plate reader set to 450-570 nm, and the data saved and analyzed. Once all ELISAs have been completed, unused stock plasma will be replaced into the thawed aliquots and frozen for future use. The biomarker workflow and timeline are detailed in Table 1 and Table 2, respectively. Once completed, concentrations of 6 different proteins have now been quantified on the same plasma sample using a total of 150 μL of plasma. Plating the samples in duplicate per test allows for internal quality assurance, with CV's less than 10% being optimal. If performing the sequential ELISA on multiple plates, consistent optical densities of the high standard are preferred and allow for improved inter-plate reliability of measurements; standard curve ODs can be compared between plates to look assess for inconsistency in ELISA performance (Figure 2). Development times using tetramethylbenzidine colorimetric substrate and high concentration ODs observed for each biomarker in our laboratory are listed in Table 3. Figure 1. 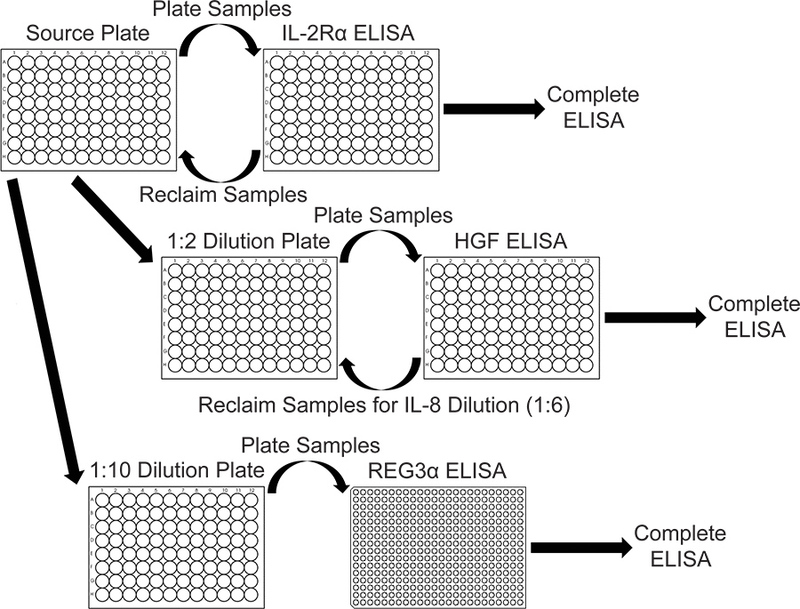 Workflow for IL-2Rα, REG3α and HGF ELISAs. After the plasma samples have been plated on the IL-2Rα ELISA test plates it is reclaimed to make dilution source plates for other ELISAs. For the HGF ELISA, the plasma is reclaimed to prepare the 1:6 dilution plate for IL-8. Click here for larger figure. Figure 2. 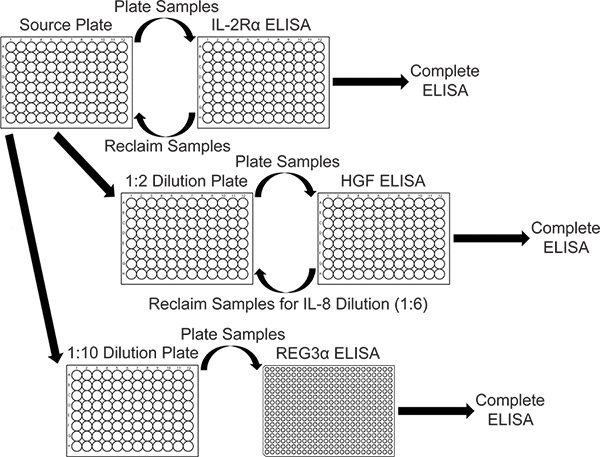 Optical Densities for the standard curve of 7 different ELISA plates measuring REG3α concentrations corresponding to the 1084 patients tested for the initial REG3α GI GVHD biomarker report3. Consistent ODs between plates assure consistent protein concentration measurements between plates. Concentrations of proteins in plasma samples are calculated by comparing sample optical densities to the standard curve optical densities. Table 2. Timeline for performing ELISAs. Table 3. ELISA Details for 6 GVHD Biomarkers. The sequential ELISA method presented here allows for measurement of multiple plasma proteins on small volumes of plasma which may be difficult to obtain and/or irreplaceable such as samples from human subjects with rare diseases or plasma samples obtained from mice9,10. The sequential ELISAs are typically performed in the order of increasing plasma dilution factor, with ELISAs requiring plasma diluted ≥ 1:10 typically not needing to be reclaimed, although this can be done if desired. The ability to perform sequential ELISA is limited by ELISA kits/protocols in which the plasma is mixed with other reagents or for which different dilution buffers are required for the plasma; this precludes the ablility to re-use a sample due to concerns that an incompatible buffer/reagent will interfere with the performance of a particular test. With careful planning, 10 or more ELISAs may be performed on the same plasma sample. Individual laboratories may need to adjust plasma dilutions in order to have interpretable results based upon expected plasma concentrations of the protein of interest in the samples from the test subjects. Differences in laboratory equipment may result in the need to optimize incubation and colorimetric development times, number of washes and/or wash soak times in order to optimize any given ELISA. To increase high-throughput capacity and accuracy and to perform analyses in a cost-effective manner, the use of a robotic liquid handling platform capable of analysis on 384 well plates and an automated plate washer with stacking unit are recommended. This equipment can increase the accuracy and precision of analysis performed by multiple users, and help provide consistency of analysis to reduce inter- and intra-assay variation. We used sequential ELISA over available multiplex platforms for two reasons: 1) Most of the antibody pairs for novel proteins cannot easily be conjugated on beads or other material as well as time consuming and expensive; 2) individual ELISA assays are more precise than multiplex microarray or beads, secondary to an absence of cross-reactivity11 . If a reliable method is established to perform multiplexed, bead-based microarrays, it may be able to replace the sequential ELISA process, but may be limited by the ability to conjugate the antibodies to beads and/or by the number of proteins desired to be analyzed. Supported by NIH grants RC1-HL-101102, P01-CA039542, T32-HL007622, the Hartwell Foundation, and the Doris Duke Charitable Foundation. Dr. Paczesny is an investigator of the Eric Hartwell fund and the Amy Strelzer Manasevit Research Program. Paczesny, S. A biomarker panel for acute graft-versus-host disease. Blood. 113, 273-278 (2009). Paczesny, S. Elafin is a biomarker of graft-versus-host disease of the skin. Science Translational Medicine. 2, 13ra12 (2010). Ferrara, J. L. Regenerating islet-derived 3 alpha is a biomarker of gastrointestinal graft-versus-host disease. Blood. (2011). Ferrara, J. L., Levine, J. E., Reddy, P. Graft-versus-host disease. Lancet. 373, 1550-1561 (2009). Miyamoto, T. Serum concentration of the soluble interleukin-2 receptor for monitoring acute graft-versus-host disease. Bone Marrow Transpl. 17, 185-190 (1996). Holler, E. Role of tumor necrosis factor alpha in acute graft-versus-host disease and complications following allogeneic bone marrow transplantation. Transplant. Proc. 25, 1234-1236 (1993). Okamoto, T. Increased hepatocyte growth factor in serum in acute graft-versus-host disease. Bone Marrow Transpl. 28, 197-200 (2001). Uguccioni, M. Elevated interleukin-8 serum concentrations in beta-thalassemia and graft-versus-host disease. Blood. 81, 2252-2256 (1993). Osuchowski, M. F., Siddiqui, J., Copeland, S., Remick, D. G. Sequential ELISA to profile multiple cytokines from small volumes. J. Immunol. Methods. 302, 172-181 (2005). Osuchowski, M. F., Remick, D. G. The repetitive use of samples to measure multiple cytokines: the sequential ELISA. Methods. 38, 304-311 (2006). Schweitzer, B. Multiplexed protein profiling on microarrays by rolling-circle amplification. Nat. Biotechnol. 20, 359-365 (2002).